Добавить в корзину 1 шт. на сумму 12 321 руб. 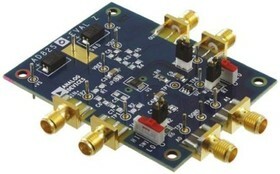 The AD8251-EVALZ Evaluation Board is designed to enable quick evaluation of the AD8251 10MHz Gain=1.2, 4.8 iCMOS® Programmable Gain Instrumentation Amplifier. The evaluation board includes on-board gain setting switches to quickly demonstrate the AD8251&apos;s software gain programmability. There are SMA connectors for high speed gain testing.